Here on July 27, 1861, less than 300 Confederate troops intercepted 500 Union soldiers retreating from Fort Fillmore to Fort Stanton. Exhausted from the heat and famished for water, the Union troops straggled across the desert in a five-mile evacuation train. Unable to fight, Major Isaac Lynde surrendered his command without firing a single shot. Location. 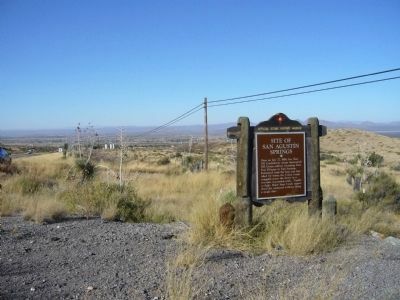 32° 25.809′ N, 106° 35.101′ W. Marker is near Las Cruces, New Mexico, in Dona Ana County. 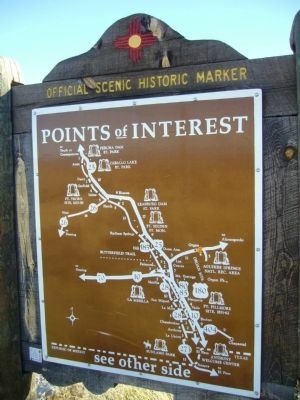 Marker is on U.S. 70 at milepost 177, on the right when traveling west. Touch for map. Marker is in this post office area: Las Cruces NM 88011, United States of America. Touch for directions. Other nearby markers. At least 8 other markers are within 14 miles of this marker, measured as the crow flies. San Augustín Pass (approx. 1.2 miles away); Nike Hercules Missile (approx. 1.3 miles away); White Sands Missile Range (approx. 7 miles away); Pat Garrett Murder Site (approx. 9.2 miles away); Heroes of Bataan (approx. 11.7 miles away); America's First Battle of World War II: The Philippines (approx. 11.7 miles away); The Historic Green Bridge (approx. 12 miles away); Rio Grande Theatre (approx. 14 miles away). Touch for a list and map of all markers in Las Cruces. More. 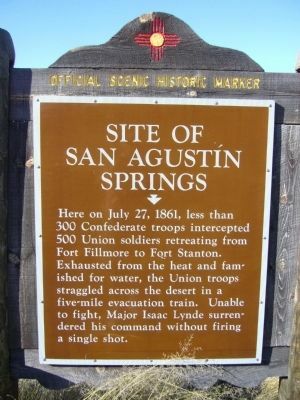 Search the internet for Site of San Agustín Springs. Credits. This page was last revised on June 16, 2016. This page originally submitted on November 18, 2010, by Bill Kirchner of Tucson, Arizona. This page has been viewed 908 times since then and 18 times this year. Photos: 1, 2, 3. submitted on November 18, 2010, by Bill Kirchner of Tucson, Arizona. • Craig Swain was the editor who published this page.